Michael Pattison | idFilm: Canons and Balls: Whose and How? Canons and Balls: Whose and How? 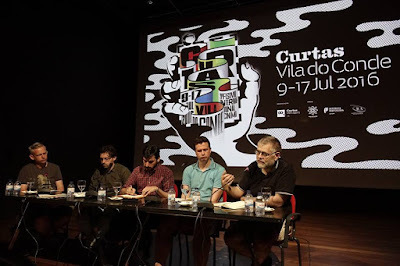 Just less than two weeks ago I appeared on a panel discussion at Curtas Vila do Conde, a shorts film festival in Portugal, on the relationship between film critics and short films. There were three other panellists: Neil Young (UK), Luís Mendonça (Portugal) and Jorge Mourinha (Portugal). Víctor Paz, a critic and programmer from Galicia, Spain, moderated the discussion. With the exception of Luís Mendonça, who I hadn’t met before, I would call all of these fellow panellists friends. Víctor had primed us in advance as to some of the topics we’d be covering over the course of 90 minutes; the starting point, as a means of discussing why short films tend to be overlooked by journalistic film publications, was the importance of criticism in building (and re-building) a film canon. When an entire panel is composed of male participants, however, starting points become primary foci: we men not only like to hear our own voices, we also like to hear them above others. We like to interrupt, impose, talk over one another. Meander, harp on, answer questions we haven’t been asked. We catastrophically miss the forest for the sound of our own opinions echoing through the trees. When I was on a panel discussion about criticism at the Manaki Brothers Film Festival in Bitola, FYROM last year, one of my fellow panellists jokingly congratulated me for dominating the discussion even though I'd been outnumbered by women four to one. Víctor, I understand, had intended to bring up the gender bias before I remarked how embarrassing it was that we found ourselves chatting publicly about canons without any input or platform from a non-white, non-male perspective. Canons, I noted, are ontologically white and ontologically male: as an organically formed reflection of the multitude of voices that shape them, the strength and depth of any canon is dependent on the strength and depth of the constituting field. Things are always changing, but we have a long way to go. The reason the film canon heavily favours features over shorts has something to do with the institutionalisation of the film industry and the standardisation of average running times for theatrical distribution. It’s also no doubt down to the class, ethnicity and gender of those who sought such standardisations, and who continue to maintain them as the only profitable norm. Found at the more localised, autonomous end of the spectrum, shorts tend to be more experimental, non-narrative, in line with visual art and exhibition practices more akin to gallery spaces and installations. They operate by their own codes and conventions, and their historical trajectory is distinct from that of the feature film. It might also have something to do with a general culture governed by the market, which demands of artistic labour a utilitarian value. Feature films can be sold to a paying public in a way that short films cannot, which means there’s no commercial industry drawn to them. Which means that journalists restricted to theatrically released films never get to write about shorts and why those attending film festivals cover films for which they can be remunerated (i.e. selling film reviews to magazines and so on). Are these two things related: the emergence and maintenance of a film canon whose makeup is largely heteronormative on the one hand, and the emergence of a necessarily more marginalised but more radically diverse field of short films on the other? If so, the first question is how the more marginalised field can be incorporated into a more mainstream platform. Our discussion drifted into one of bums on seats: how do we get people to watch short films when their default viewing and social experience is overwhelmingly comprised of paying (or not paying) to see features? One answer, put forth recurrently, advocated a form of trickery, and perhaps surprise: screen a short, or shorts, before a feature — which in any case has its own problems, logistic and otherwise (features are getting longer and longer, and pre-film adverts these days are running for twenty minutes or more). I’m not convinced, partly because these kinds of panel discussions produce in me a broken-record tedium, and partly because the solutions sound too easy. One reason why such discussions tend to loop back on themselves is that, in order to break free of their cul-de-sac reasoning, we might have to start asking tougher questions. For me, the obvious conclusion is facile but it’s seldom advanced because it defeats the purpose of the panel and admits that more difficult work is required. It’s this: if you want to transform the parameters of a cultural discourse and the hierarchies that characterise it, you have to transform the social conditions and property relations that define that cultural discourse — including the marketplace, the means of production, how art is funded and produced and who gets to fund and produce it. This is a two-way battle, one that consists of smaller, more local battles (trafficking the marginal into the mainstream, however decrepit the latter now seems). But film criticism won’t save itself. Does it even need saving? When panel discussions composed of film critics inevitably turn to the state of criticism and the difficulties of getting the job done whatever that job may be, I’m increasingly astounded by the defences put forth of criticism. As if it ever needed to defend itself. Why now? Rather than asking how we can save criticism — presumably, in order to save the industry and to continue shaping the canon of which we’re so fond — I’m inclined to ask from whom or what it needs to be saved. From rightward shifts in the press, certainly. From the austerity agendas that are threatening the very basis of life, yes. From budget cuts and a general hostility to the arts, for sure. The need to fight against these trends is particularly sharpened for film critics, given just how incestuous their industry can be, and will continue to become, due to the dreadful economic predicament that is deciding who has access to it and who doesn’t. One defence, put forth by Jorge Mourinha, promotes criticism as a public service: its role is to enlighten, inform, draw people’s attention to films they might not otherwise know about. For Neil Young, the job of a film critic is to make films better: by praising a film, you’re encouraging funding bodies to make more like it, and by saying one is terrible, you’re by proxy suggesting other films like it shouldn’t see the light of day. I’ve seen Neil pull out this line before, on a similar panel in Locarno in 2013, and while its bluntness always gets a laugh, I think it grossly overestimates the commercial influence of critics. I’m of the increasing conviction that criticism, rather than suffer the indignity of death-by-panel or a book-length vindication by A.O. Scott, should be approached as an artistic practice, a particular and peculiar form of creative non-fiction. Criticism serves, in the first instance, nobody other than the critic: it’s a process of coming to terms. Maybe this is a definition of criticism rather than good criticism, but anything else is a bonus (or, if people are reading bad critics, maybe it isn’t). At any rate, I’m writing this while, at the Palić European Film Festival in Serbia, a kind of super-panel discussion is taking place, composed of no less than nine film critics. The topic, surprise surprise, is ‘the state of European film critics’. I think I've seen that one already. I hope that quantity produces quality: critics have endured so many deaths by now that this debate to end all debates really needs to end them. On a more positive note, the men are outnumbered four to five.